If you attend university in Toronto, at some point during your post-secondary education you and your friends will come to live or play in the Annex neighbourhood—and you’ll use Bathurst station. Opened in 1966, the station is presently gifted with a couple of aural quirks that seem amusingly correlated. As you walk the corridors, the sudden squawking of distressed pigeons might startle you. These recorded sounds are part of a trial project to reduce the presence of the winged pests, which poop everywhere and make the station less cleanly. nuisances like this one. Begone, ye winged pestilence! Additionally, you might detect the refined strains of Bach or Beethoven wafting through the air. After a 1998 stabbing at Kennedy station, the TTC decided to begin playing classical music at certain locations to deter noisome and unruly teenage loiterers (perhaps this is how the pigeon idea originated). 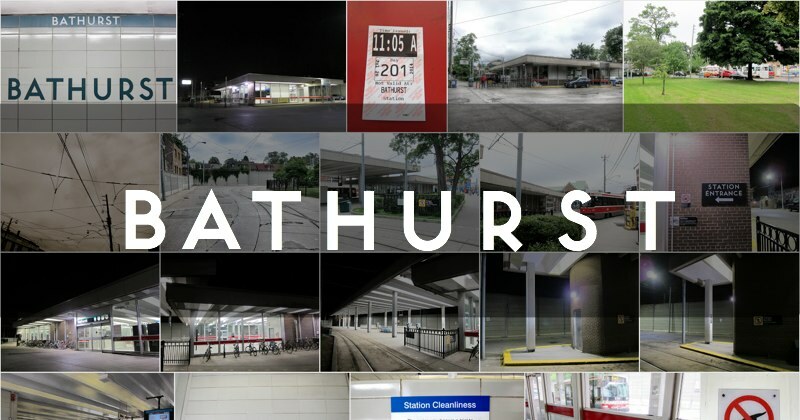 Bathurst station is one of several—Kennedy, Warden, Victoria Park, Main Street, Greenwood, Dundas West, Runnymede, and Finch being the others—that are occasionally graced with the music, at a reported cost of $14,500 a year. Personally, I’d advocate for classical music at every station! It adds refinement to the trip. Just north of the main station entrance, the Ed & Anne Mirvish Parkette honours the flamboyant businessman whose Honest Ed’s warehouse emporium has been a community landmark since 1948. When Honest Ed’s finally disappears in the not-too-distant-future, the complexion of the neighbourhood will change irrevocably, and this under-used parkette will be all that remains. 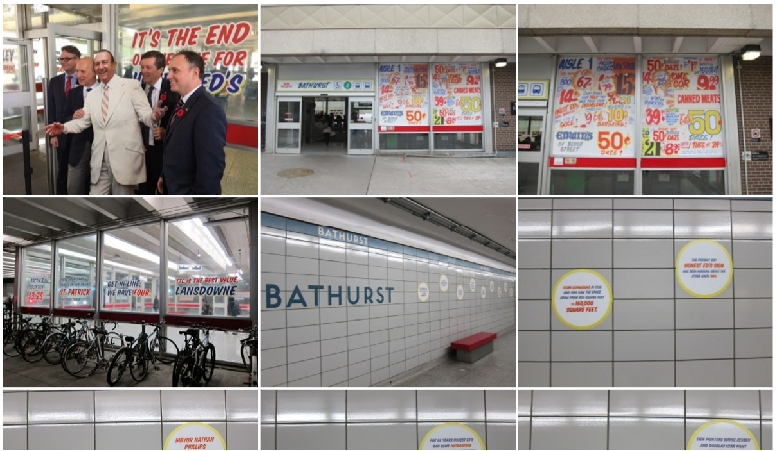 I know in my heart that Honest Ed’s time has come and gone, but all the same, we’ll miss it. Outside the Markham entrance, there is an Urban Forest Demonstration Garden assembled by LEAF, a not-for-profit advocacy group. The garden is best viewed during the day; it’s... sketchy feeling at night. The final aspect that this station is known for (not counting the patties from the bakery shop), is its connection to the 511 Bathurst streetcar route. Hop on it and ride down to the CNE! Bonus historical tidbit: Bathurst street was named for Henry Bathurst, 3rd Earl Bathurst. North of Queen St. it used to be called Crookshank’s Lane (after George Crookshank), but this was changed in 1870. Imagine going to Crookshank station! And here’s the TTC video about the transformation. Some coverage.